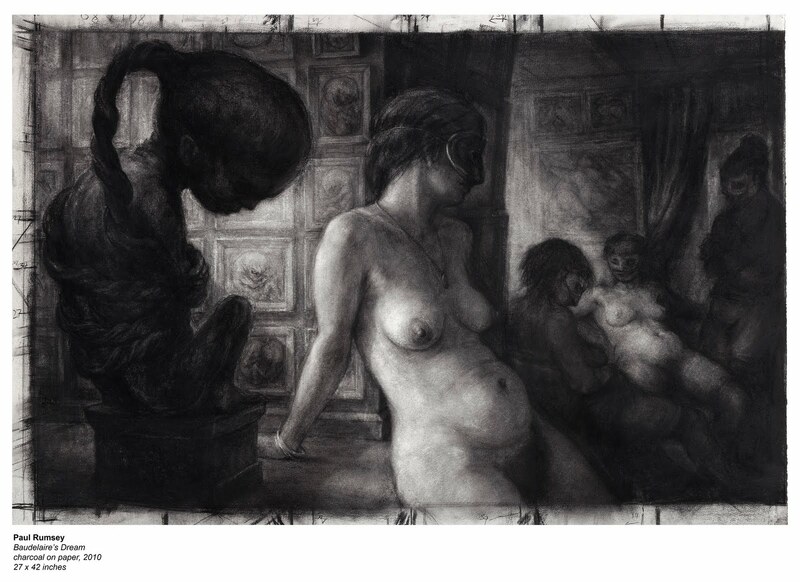 The artist Paul Rumsey--who you may remember from this recent post--just sent along a wonderful new work (see above) based on a circa 1856 dream of the symbolist poet Charles Baudelaire. Baudelaire wrote a letter to a friend telling him about his dream. He dreams that he goes to a brothel, which is like a gallery, and finds that part of it is a medical museum. There are pictures on the wall of fetuses that the women in the brothel have given birth to. One fetus is alive and has lived there for years, it spends all day sitting on a plinth, as part of the medical exhibition. It has a rubbery appendage growing from the top of its head which it has wrapped around its body. Baudelaire has a conversation with it, then wakes up and finds that he was sleeping in the same position as the creature on its plinth. "Baudelaires Dream" is now on view in a solo show of Rumsey's work at the Galerie Beatrice Soulie in Paris until January 15th, stumbling distance from the incredible Musée Dupuytren. You can find out more about the exhibition by clicking here. Click on the image to see much larger, finer, and more detailed image. You can read the original dream in French by clicking here. A translation of the dream can be found here.